Nearly 80% of Cumberland students receive some sort of financial assistance. How can we help you finance your legal education? The money you borrow to finance your legal education is an investment in your future. Please be assured that you are in good company. Nearly 80 percent of Cumberland School of Law students receive some form of financial assistance, and you have very helpful financing options available to you. By completing your Free Application for Federal Student Aid (FAFSA) form, you are eligible to receive Stafford law school loans from the federal government in the amount of $20,500. To cover the rest of the cost of attendance, our students obtain the Graduate Plus Loan, which covers the full cost of your Cumberland School of Law education, minus any other financial aid you receive. With these two federal loans, you will be able to cover the full cost to attend our institution. Important to the financial aid process is a financial budgeting commitment. It boils down to two simple rules. Rule number one, create a reasonable budget. Rule number two, stick to it. Most years, Cumberland School of Law awards over three million dollars in scholarship assistance to entering and current students. Those students are selected based on a variety of criteria, from overall outstanding scholarships, leadership, academic achievement, and diversity to various alumni-sponsored awards. Entering student scholarships range from partial assistance to full tuition, books, and a one-time stipend of $5,000. First year students are considered for scholarship upon application and will be notified of an award upon acceptance to the full-time program. However, the Jere F. White Jr. Fellowship, the top scholarship for entering first-year students, requires completion of a separate application and essay. 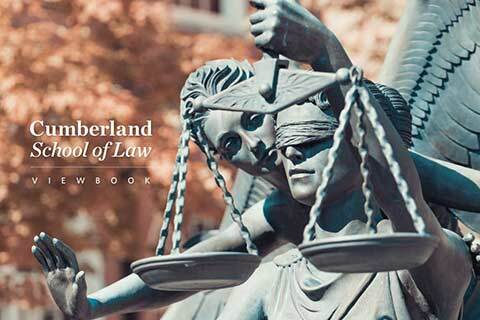 At Cumberland School of Law, there are many ways to turn your dream of attending law school into reality and manage your financial assistance, via internal and external scholarships and/or federal and private loans.